Now that's more like it! Yesterday the weather finally broke, after weeks of strong winds and hurricanes. Maui Paul was here for the day and I told him to meet me at Kahana when his work was done. But when we got there, I couldn't believe how light it looked - almost too light. Maybe we should have gone to Makapuu. 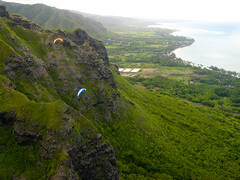 But since we were already there, we opted to give Kahana a try, and our decision was rewarded with a sweet easy afternoon of soaring. The conditions turned out to be super north, so as soon as we snuck around to the north face we found plenty of lift. Later on, One-eye and Stalker showed up and launched the north ridge to join us. I think we flew for two hours in the smooth light lift, trying to cross the bay a few times but never getting up over there. At my highest point (just over 1800) I could hear Jetflap on the radio at Makapuu, coaxing someone (Frank?) to join him in the air, calling it strong but not too bad, and not too bumpy. At Kahana, the trees were nice and soarable as we came in for a landing, and afterwards we celebrated the return of fine weather with some cold refreshments - thanks, Jeff! It was great to show Paul what Kahana was like on a lighter day like this, and I'm only sorry our other two visitors were unavailable - Breckenridge John had hurt his shoulder kite-surfing, and Richard from Georgia was working late. Maybe the next few days will remain perfect and those guys will get some airtime here before they leave. See you all out there! Bonus - Jim and I closed the place, leaving Kahana only when it got dark. Just before we left, a little cutie who's camping there gave us some pizza :) mmmmmmm... flying, cold "refreshments", and pizza. 'twas sweet.